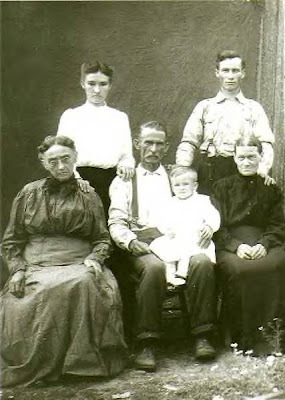 Here are my Grandad Anderson's grandparents, Andrew Jackson Anderson and Melissa Jane Fisher Anderson with their son, Oakey, his wife Bessie, and their son Rudy. The lady on the left is Barb Wolfe, sister of my mom's gr-grandmother, Elizabeth Casto Crane. Betty Briggs, on her Casto Connections website, says Barb Wolfe had a daughter named Bessie Anderson. That must be why she's in the photo--I believe she must be the other grandmother of Rudy. 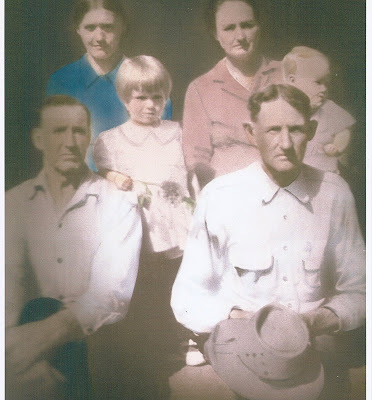 My dad's grandparents, Cell and Ethel Carpenter with daughter Francis Carpenter (Gray) and Emory and Annie Hutton with grandaughter Deloris Hutton (Simmons).